Have to keep doing factory reset then when the box next turns off it stops working again. Only black screen but there is sound. Or red button just says error. Also says sorry device not compatible but clearly is as was working before..
Can you let me know which YouView box you are using and the software version it's currently running? If you're not sure which one it is, just press Help and then Info on your remote control. Please also let me know if you're connected to the internet via Ethernet or Powerline Adaptors. Do any error messages or error codes come up when it errors like you mention? If you are able to provide any pictures of the screens you see when this occurs it'd be helpful for us to look at. Red button just says error when pressed. Or was coming on with sound but black screen. Now just says device not compatible! You mentioned before that you did a factory reset, was this the one which deletes your recordings? This usually fixes most quirks which pop up on the box from time to time which suggests that the problem lies in another area. We've tested this on our end across a few boxes and have not been able to replicate it. Can you please confirm the channel number you are using to access Racing UK? Can you also take a picture where it says device not compatible so we can see what's going on when this happens? 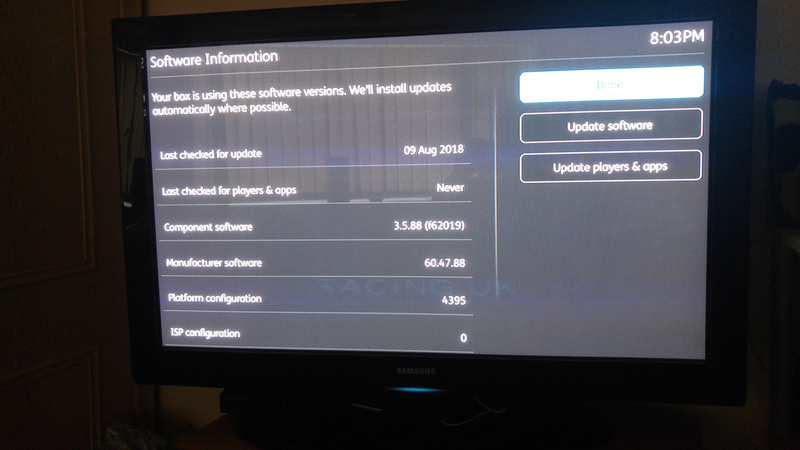 Please also let us know the Software version your box is running. You can find this through your Settings > Software Information > Manufacturer software. Hi factory reset just wipes everything and starts everything again from scratch like channel tuning and full setup. I get the message 'To view channel wait for red button then press RED. Device must be connected to the internet'. And then I connect and get it. Humax T2000. Have you tried rebooting your router and powerlines? Had to keep doing factory reset. Or if it did work i only got black screen but there is sound. Or red button just says error when pressed. Whats the specific make and model of your TV? Because not all are compatible with these Freeview interactive service channels (which have also been known to be called data channels). Wouldn't have ever worked at all though would it? Thanks again. You think the TV might have some idea what is coming up the HDMI connection, and take against it? Let us know if this changes it and allows it to launch without any errors or compatibility messages. Thanks @Dnoo69, that information is helpful to know. Our team are currently investigating this a bit further to find out what could cause this to be happening so I'll update you once I know more. Apologies for the inconvenience caused by this issue. You mentioned before that you did a factory reset, was this the one which deletes your recordings? 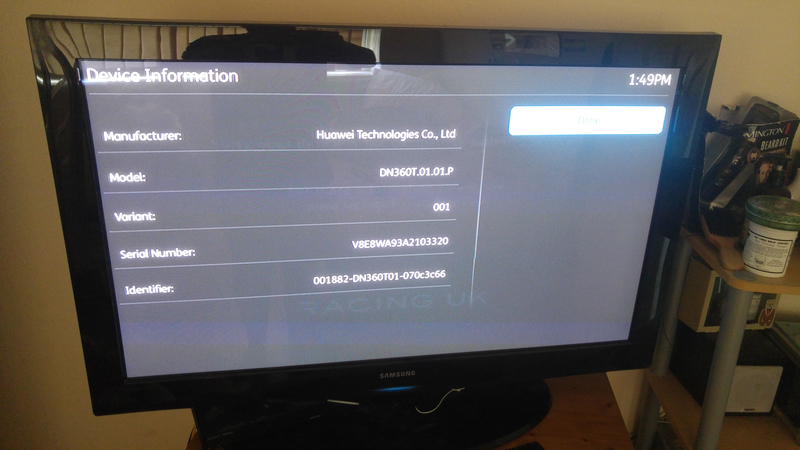 But Racing UK works fine on my Humax T2000, FWIW. It'd be helpful to know if they bring up the same issues or if they work fine. Thanks for all the help but was banging my head against a brick wall. I'm not aware a SKY magic eye will work with a YouView. But as you haven't answered any of the questions that have been asked of you on this thread that obviously makes it difficult to help. Do they work? Or fail like Racing UK? I preferred your second JPEG. We're sorry to hear that. If you are back on your YouView box and have the same issue, please let me know the answers to my previous questions as this will help us in identifying what is causing this problem. 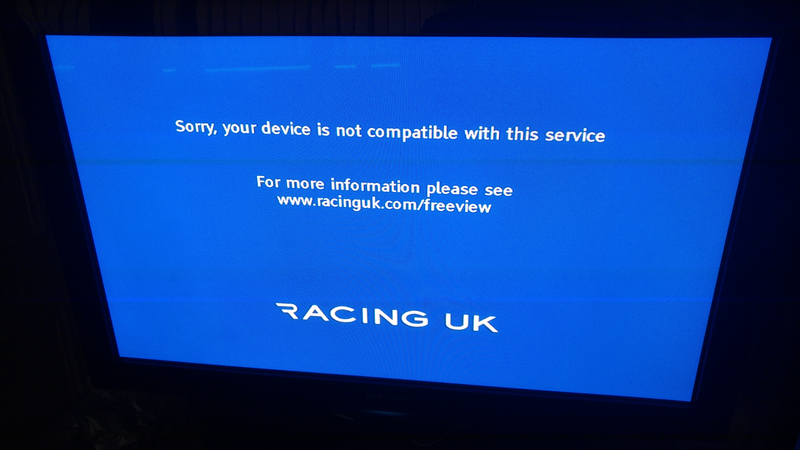 I actually subscribe to this chabbch and have had zero problems it works fine have you actually reported your troubles to racing UK because it could be there having issues in one transmitter area or are having issues supplying it to certain broadband providers.